If there’s one brand pioneering the body positive movement at the moment it’s undoubtedly Gillette. 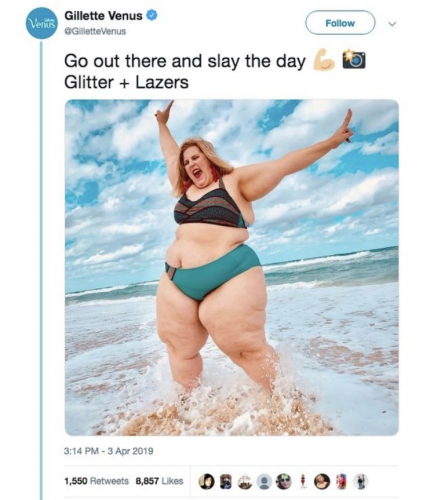 Enter its latest campaign in the UK that features body-positive influencer and author Anna O’Brien (aka Glitter and Lazers) to promote the brand’s Venus range of razors for women. And, as these things tend to do, Gillette’s decision to use O’Brien has received as many bouquets as it has buckets and shows that fatphobia is still well and truly alive. Some of the comments were so mean as to be unpublishable, while others questioned O’Brien’s physical and mental health. “There is nothing empowering about the risks associated with obesity! Celebrating destructive behaviour is irresponsible,” penned another non-fan. Interestingly, some of the biggest critics of the campaign came from overweight people themselves or people who had lost loved ones to obesity. “There’s no reason to be rude or unkind to someone who is obese and there is no reason @GilletteVenus should be encouraging life threatening obesity. This would also be true if they used an anorexic model. I wish the model they used well but Gillette should know better,” penned another. While there was also some positive messages too. “Thank you for representing the diversity of beauty of women in this AMAZING, joyous, dynamic photo,” wrote one one woman on the Instagram post. In response to negativity Gillette Venus tweeted: “Venus is committed to representing beautiful women of all shapes, sizes, and skin types because ALL types of beautiful skin deserve to be shown.